Hey there! 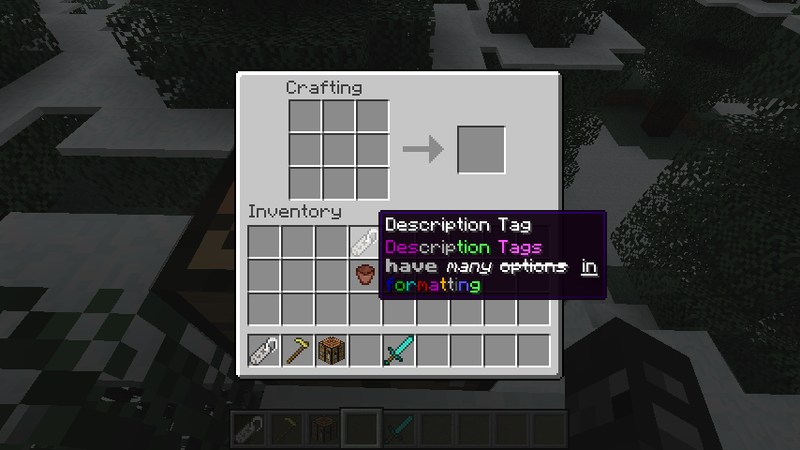 I've got a mod for you, and it's called Description Tags! Niiiiice, I really like this. Definitely gonna use. Looks like a really nice mod. Downloading. And it's 1.6.4 too! I love you! It kinda reminds me of TF2's strange weapons, Description tag. I know you said you considered this mod done, but could you possibly add an Item Showcase? Y'know, to show off our stuff, it should show the description and kills of the item being showcase. How do we use the Description tags formatting? .-. 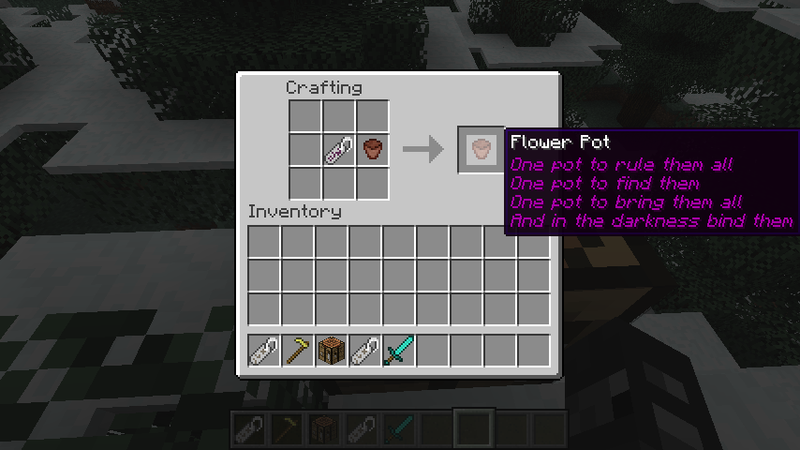 No I can't add colour to nametags, because the renaming screen of the anvil does not accept Minecraft's formatting sign §. However, the interface of the description tag does accept it. 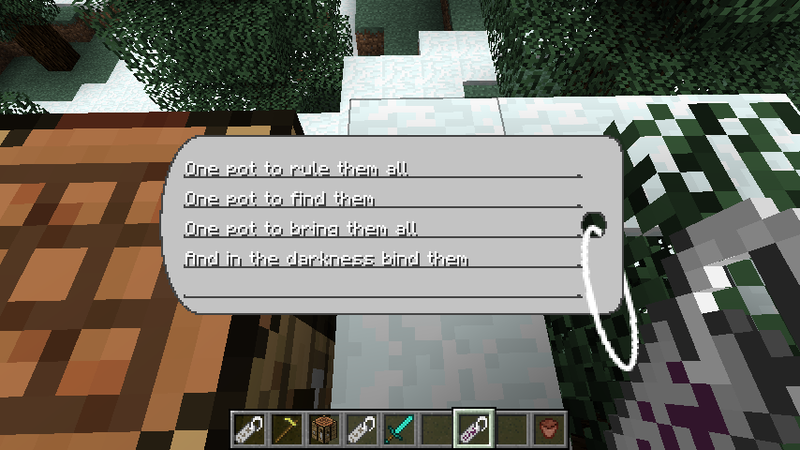 Simply type it (on my German keyboard it's Shift+3) then the formatting code (full list on the wiki: http://minecraft.gamepedia.com/Formatting_codes) and then the text. Don't worry if the formatting sign vanishes, it's not displayed when it's in use. However, I just realized, I'm fortunate to have a keyboard with the section sign on it. Apparently it's only found on the German QWERTZ layout. You can however (though is obviously isn't ideal) copy and paste the sign. I'll look into it and find a fix. Can't you use the & sign? That's something that might be used in common language though. The text is limited in size so people substitute & for and. If I were to make that a formatting code, it might ruin some texts. I was actually thinking of using a backslash, because it's usually not used in any text. When describing options, for instance, one commonly uses the forward slash, not the backward one. Edit: Apparently for US/UK QWERTY Keyboards, AltGr + Shift + S works. For now, no updates for this. I didn't realize this post went so long without comments, but I have a few things to mention. First, I made a Mod Spotlight for this mod. Aside from not doing much with the formatting (not very good with that myself), hopefully I did a good job at covering its features. Let me know if I got anything wrong or missed anything of note. The other thing is an issue of sorts my friend discovered. I use Description Tags in my mod pack, Untamed Chaos, and he reported that the Warrior Tag doesn’t work on any Lycanite's Mobs. I did also test this myself with a few mobs, passive and hostile, and only had the Butcher Tag track for both with the Warrior Tag remaining at 0. Not sure why the hostile Lycanite mobs aren’t counting as monsters, although they are rather unique so it doesn’t surprise me too much. Anyway, it isn't that big of a deal, but if you could look into the issue it would be appreciated. Which Lycanite mobs did you test on? Quite a few are in a gray area of being farmable or tameable, yet still initially hostile. Forgot how many were farmable/tamable... That could explain it. Also, it has been a while and I forgot what I tested it on. Nice! Kinda like the one from TF2! Butcher Tag is the Strangifier! Please add support for other mods! 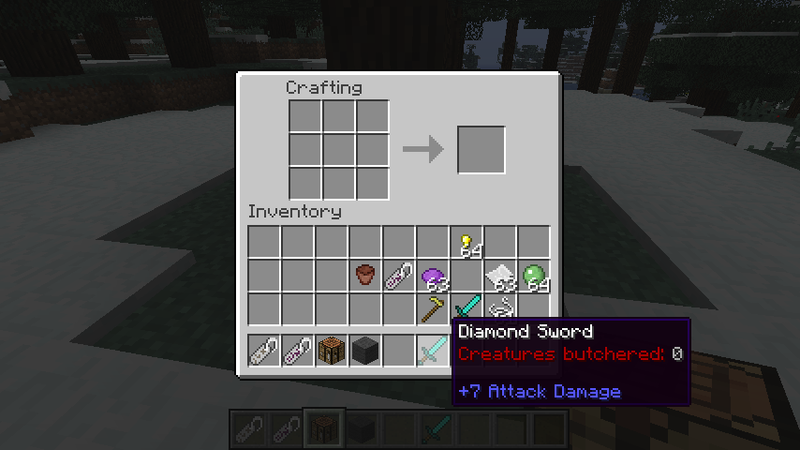 Also does the Butcher Tag works on ranged weaponry? 10/10! This mod does not have near enough downloads or attention as it deserves! It's a wonderful addition to Minecraft. Hopefully it gets updated to 1.8 or 1.9 though :). Would be great to have it on modpack servers! I think BluSunrize forgot about this. Nope. In fact, it's one of my mods I'm fairly proud of, due to its simplicity. Whenever I'm asked what mods I made, I always mention this one. The reason nothign happens in here is because the mod is finished. There is no more content to add and I'm not planning to move to 1.8 for now, so there is no need to do any work on it. Oh, okay. Thought it was dead because it was not getting not as much attention as your other mods.